Visited but didn't stay overnight. Talked to long-time mgnr, Teresa. She said big upgrades will begin April 2017. 20 new pull-thru' sites are being added. They will be back down the new road that currently leads to the refurbished FEMA trailers (now cute little cottage looking units). There is a new gate to Barksdale AFB in the new family housing area, approx. 5 miles beyond the FamCAmp. It doesn't admit RV's or big trucks. The gate that RV'ers now must use (detailed above) off of I-20, exit 23 -has new hours. It now closes at 1715 daily. If you're coming to Barksdale plan on arriving before it closes. There are no other gates that large enough to handle large trucks, RV's, motorhomes, etc. Besides these chg's Barksdale FamCamp looked about the same. 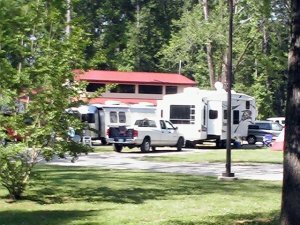 Some of the vacant sites are the ones with "backwards" hookups and can't be used by most RV'ers. maybe they'll get those fixed during the big upgrade next yr.